The Indiegogo campaign for Miranda’s new book has almost reached its goal, but the campaign is only on until Sept 15th. Go check out Confessions of a Professional Blogger and claim your perks! But what if what you know isn’t what’s in demand? When I first started writing online, I wanted to write high-minded pieces about politics, science, and religion. One of the first things I discovered at the time was that, while I landed a science-writing gig fairly early on, politics and religion didn’t pay well. S ince I didn’t have a big name, or big credentials, paid gigs about politics and religion were pretty well out of my league. Instead, I did a little research. What was in demand? I found that I could be paid for writing about window treatments on a catalog site, and about theme weddings for a lifestyle site. No one wanted to pay me for my analysis on politics (so much for the poli-sci minor), but they were ready to shell out for my thoughts on window treatments. Later, I caught a break when someone asked me to write about finances. It was 2006, and my only regular gig was writing for a science web site; all my other income came from writing anything anyone would pay me for. When offered a regular staff writing gig for finances, I jumped at it — even though my entire knowledge of finances revolved around the fact that I had racked up too much debt in college. That’s when I decided that writing what you know is great, but it won’t pay the bills if what you know isn’t in demand. So I learned to write to demand. My journalism training taught me that you don’t actually have to be an expert on something to write about it. Instead, you need to know how to write. Rather than worry about about knowing everything about a topic, learn a little bit about it (to start), and then write well. Learn research skills: Efficiently research the topic in question. Develop basic research skills that can help you learn the fundamentals. Over time, as you write more on the subject, you can add commentary and your own philosophy. Interview others: If you can’t write from a place of your own expertise, use the expertise of others. Develop interview skills and learn how to tell others’ stories in a way that is engaging. Interview experts to add depth and legitimacy to your writing. Practice, practice, practice: The best way to improve your writing is to practice. The more you write, the better you’ll become. In the end, clients wants someone who writes well. If you can show that you write well, and know how to organize information and tell a good story, you’ll land gigs writing about what’s in demand, no matter your lack of expertise. While I ended up mainly in a niche (finances), I can write about more than just money. Recently, I’ve written about baby-proofing homes, law, and technology. While financial topics are my main focus, there are a few non-money blogs that I write for. You don’t need to limit yourself to a niche to make money as a professional blogger. There are thousands of blogs looking for good writers. Show that you are capable of providing well-researched and sourced content, and presenting it in an interesting way, and you’ll have plenty of work. Don’t worry about writing what you know. Instead, focus on writing what you can learn. 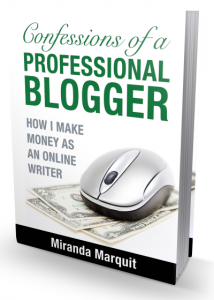 Miranda is a freelance writer and professional blogger. Her upcoming book is Confessions of a Professional Blogger. That is also the name of her blog on freelance writing. basically you have to review the topics clearly eventually, we have to find niche of it because its really crucial at the end. Thank you for this post. I have been saying this to other people I write and work with. There is too many people that want to write but will not do articles on topics they are not interested in. You have to learn to adapt so I agree with this. I like this post. I guess all of us, at some point in our blogging career, are guilty of committing the mistake of writing about what we know because it’s easier on our part. It takes time to really realize that if we want to make a business out of blogging, we have to cater to the needs of the readers. We have to fulfill their needs and address their concerns in order for them to patronize whatever it is that we have to offer. At the end of the day, it’s all about them not us. I can relate so much to this article. I used to have a blog which was created mainly for personal purposes. It served as a journal and I just wrote whatever I fancied. It didn’t do well in terms of traffic despite the fact that I so much enjoyed updating it on a regular basis. Later on I realized that if I want my site to be income-generating, I have to specifically cater to what the audience or readers need; I should be writing something THEY like and not what I like. Very good post. Looking for potential and learning to improve my writing skills. Thanks so much for putting this together. I think that knowing what you are going to write about is very important but educating yourself about a topic and doing it that way can also work for writing good blogs. This article makes total sense! Even if we don’t fully know about something, we can always research as we contemplate what our blog post is going to be about. This is a great article on writing and is sure to inspire many in that field. Most people would probably just keep going against the grain because they have knowledge or degrees in certain areas but you have shown that sometimes looking at different avenues other than what you may be familiar with can actually be more rewarding. I am agree with your’s important words that we must only write those things that are in demand , not those things that we know .I will do my job according to it. With this article you totally validate something that I learned the hard way. Most people approach blogging with a ‘Me, Me, Me’ attitude. Blogging about their interests, from their perspective, and on topics they are passionate about. Now, sure, people share passions, so you will appeal to some doing it that way. However, if you write from a perspective of “What do readers want”, in other words what is in demand, you write for readers, not for yourself, if that makes sense. That was a lot of rambling to say that I think writing about an in-demand topic that you are not an expert in can make you a better writer. In blogging we write on the demands of the world that people wants on net but i think we write own interests of topics is also useful and we also enjoying it . This is exactly something we hardly care. We writer about anything without thinking about the demand. You have made a valid point. We really need to write those things that can be helpful to many. Thanks Miranda for the helpful information. Ver thought provoking for me. Where does a blogger go to find people/blogs to write for? There are a number of web sites available and job boards. I like MediaBistro.com as well as FreelanceWritingGigs.com best, though. Good luck in your efforts! Thanks Miranda! I appreciate the response. I am familiar with jobs.problogger.net, but I had not heard of Media Bistro or Freelance Writing Gigs before. Thanks for the tip! I have used MediaBistro.com and it has been awesome to be on that site.I will also suggest Joshua to with that.Best of luck. You have mentioned very deep things here , I am agree that we must only write those things that are in demand , not those things that we know 🙂 Exactly agree and helpful . Now i will try to work like this way . I’m glad you enjoyed the post, Liudas! That’s a great idea to drill down in your niche a little bit more to get an idea of popularity. A really great post. Writing about what’s in demand brings far greater results and that gives me an idea to actually do a bit of research of my niche to figure out what’s hot right now and focus on that more.